Yes, I have to admit it! I too have given in to letting my daughter, 2, use my iPad! I, too, was very sceptical and would have preferred not to. But it is a good learning tool. I am one of those mums who thinks that children should only watch TV when they are old enough to control it and understand what they are watching. I never have the TV on during the day when I am home by myself with (or without) LJ. Don't get me wrong, I love technology (maybe not as much as my husband) but I love hi-tech gadgets. But I would rather encourage my daughter to read and play by herself than have her watch TV. This being said, our household got an iPad recently. My husband straight away got our daughter some children apps. I needed to be convinced. While I love the iPad, for me, I wasn't sure this was what a two-year old should learn to use. Oh boy did she learn to use it! And quickly! In just a few days, she could navigate with her little fingers to get to her folder. She thought for a while everything was a touch screen and tried to control the TV or the digital camera by touching the screens. A lot of children apps have versions in different languages. Her favourite is Nighty Night. It is an app designed for very little ones who like animals. The child has to click on farm animals and make them go to sleep by turning off their light. The design of the app is beautiful and the narrating voice (in English) calming and soothing. This app comes in French, English, German (and a few other languages we don't speak). LJ normally listens to/plays with this app in English. We thought she could learn a few animal names this way as we are not encouraging English much at the minute. But the other day I switched the app to French (just to see). Oh you should have seen her little face light up! She smiled and laughed again and again as if she was seeing it for the first time. I then switched it back to English. Today, she was looking at it again and after a while started saying to me "monsieur". I didn't understand at first. But she kept repeating it and didn't want to continue. I finally got it! She wanted the other "monsieur": the one speaking French. So I switched and told her: "le monsieur qui parle comme Maman" (the man who speaks like Maman). She was happy and repeated "monsieur comme Maman". Now, while this is not great with regards to my plan to use the app to develop her English, I am convinced this is great for anguage awareness. She is aware that Maman and Papa speak different languages. She is less aware about other people's languages and language choices. This is probably the first time she comes to choose from different languages (outside of Papa and Maman). Language awareness typically develops around ages 3-4. I am not talking myself into thinking she is aware about French and English but she is on the road to it. Of course, this is something bilnguals and monolinguals are good at because it is part of everyday life for them. 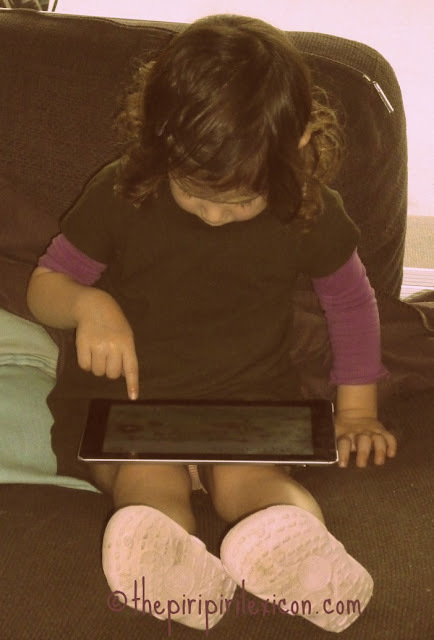 Just wait till she's four--she'll be able to do all sorts of activities in English on the iPad! I love your story of the "monsieur qui parle comme maman." Can you explain further your comment about language awareness not developing until around ages 3-4? I feel sure that by three Griffin could identify who spoke English and who spoke French to him, even bringing books in French to me and English ones to my husband. It sounds like your daughter has already figured it out, too! Sarah... I guess I was more talking about meta-language awareness (awareness about the language - knowing that what Maman speaks is one language and what Papa speaks is another called Portuguese). Language differentiation appears from 2 years old according to research. From around 2-3 years old, bilinguals are able to accommodate their interlocutors by using more of the words that person knows. Hi Annabelle, just wanted to say hello as I just discovered your blog. We are teaching our almost 3 yr old son English, German and Thai, so this is very interesting to me as I haven't really ventured out to connect with other multilingual families. It's a whole new world out here! Hi... Lovely to ahve you with us.... You will soon see that this is a very friendly community! I agree..the Ipad can be a great learning tool..the Nighty Night app sounds great...I´ll definitely be checking it out! 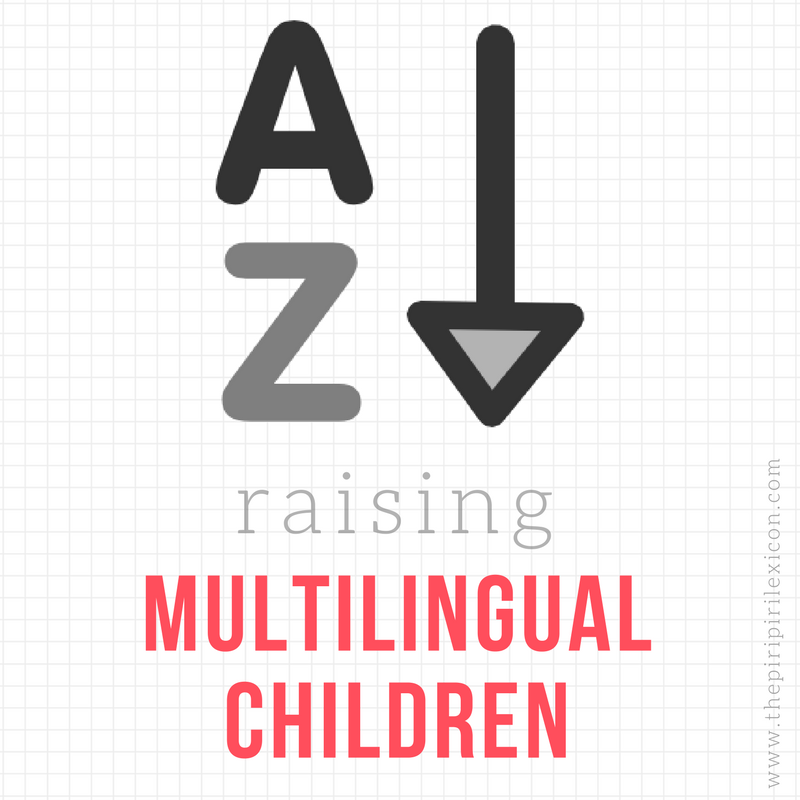 Really enjoying your profiles on other multilingual families too and discovering new blogs!